The dispute over the next FAT presidency election is still not settled. Thailand now is not only in danger to be banned by the world governing body FIFA, after latest developments Thailand may even face two elections. Lead by presidential candidate Virach Chanpanich and Chonburi FC Vice president Annop Singtothong, the opposition met with SAT governor Kanokphand Chulakasem on Tuesday morning. Their concern: To get the legitimisation from the SAT to hold the Thai FA election as soon as possible and independently. Backed by 108 members, the opposition owns the necessary majority to call up a meeting and to stage the election of the next president. As if there were no other problems in Thai football, officials, clubs and authorities are in a hard dispute over the realisation of the next presidency election. Besides, a fourth division side from Pattaya plays no unimportant role and Thailand could face a FIFA ban. To make the whole things even more complicated for laymen and people who are not familiar with the local structures in the sports ministry and his connected football association, the world governing football body FIFA is involved. Namely in a manner which raises the question whether FIFA interfere in national sports affairs to secure a possible reelection of Worawi Makudi. The efforts towards a cooperation between the German Football Association and the Thai association continue. Within a meeting between representatives of both sides, Winfried Schäfer also introduced his concept helping youth football in Thailand to develop. Over and over again there are rumours, announcements and false reports around the future of Winfried Schafer as Thailand's national coach. Notwithstanding, the German speeds up his aims to bring football in Thailand forward. One of his main target is a possible cooperation with the German Football Association (DFB). After initial talks in Frankfurt some months ago, there was a second meeting at the end of April in Bangkok. There, Markus Weidner a representative of the DFB and persons responsible of several clubs, have met for further talks. The aim is to reach a similar cooperation already existing between the German Football Association and the associations of Japan and China. The German FA, primarily, shall help in the areas of coach and referee's education as well as in helping to build up and develop a youth league. The ASEAN Football Federation have set course for the future the last week on its ordinary congress. Beside an award ceremony and a draw, the association unanimously supported the initiation of a new member. At the AFF's 20th ordinary congress, the association held an inaugural award ceremony with Thailand winning four of the 18 prizes. Referee of the 2012 (women): Pannipar Kamnueng; Fustal Player of the year 2012: Suphawut Thueanklang and for the best Futsal national team. 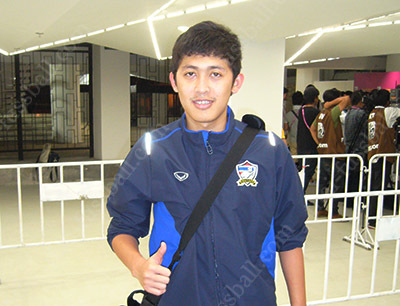 Teerasil Dangda's equaliser against Malaysia at the semi final stage of the AFF Cup was named "Goal of the tournament"